Best-laid plans — During a strategy session for the Pandaren campaign, Mokvar has some choice words for Malkorok. Words from a Scribe — Mokvar makes his first guest post, and shares a cathartic meeting between Saurfang and everyone’d friend, Malkorok. Spazzle Speaks: Here We Go Again — Mokvar and Ji Firepaw return from what seems to have been a harrowing trip to Winterspring, and Krog intercepts another mysterious attacker. Confessions of a Mercenary — Mokvar recounts his past as a mercenary, and reveals the truth about his attackers. Demonology Anonymous — Mokvar details the return of old friend Deliana from Ironforge, and the cause of the renewed attacks from Valthalak’s spectral assassins. Monday mailbag — Garona, who has been shadowing Mokvar to protect him from further attacks, reports to Garrosh that Mokvar has been meeting with the human Deliana. Moving on to Plan B — Now that Garrosh knows about Deliana, Mokvar needs to get to the bottom of the Nether Prism situation, and quickly. Demon’s Bargain — Mokvar extracts information from Neeru Fireblade that points him toward the Council of the Black Harvest. Desperate Times — Mokvar sets out for Ironforge. 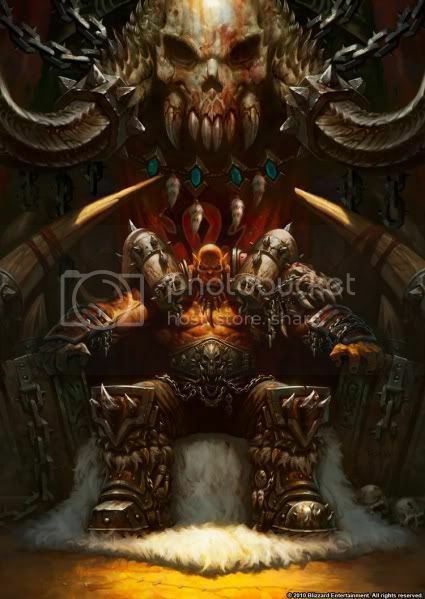 Spazzle Speaks: Charges from Dun Morogh — Word reaches Orgrimmar that Mokvar has been charged with murdering a dwarf while under diplomatic cover in Ironforge. In the Pale Moonlight — Mokvar cuts a deal with an unlikely new ally: Magatha Grimtotem. Spazzle Speaks: Homecoming — Mokvar returns to Orgrimmar…under arrest. Spazzle Speaks: Refugee — A few days after his capture, Mokvar escapes from Orgrimmar — and Eitrigg orders the severest of punishments. Spazzle Speaks: Tell Hell — Mokvar sneaks onto Earth Online to give Spazzle a message. Spazzle Speaks: Parting Gifts — When Spazzle meets Mokvar and Deliana in Winterspring, he receives few answers, but one enormous gesture of trust. Slow burn — Garrosh receives Garona’s report on what’s been happening with Mokvar in Orgrimmar, and is none too pleased with what he learns. Spazzle Speaks: The Goblin is Always Greener on the Other Side of Guild Chat — …Spazzle is faced with a troubling possibility concerning Mokvar. Spazzle Speaks: Dead End — Worst of all, faced with dire prospects for Mokvar, Spazzle finds himself left with precious little he can do. The Tao of Ji Firepaw — Garrosh learns of Spazzle and Ji’s clandestine activities surrounding Mokvar, and responds in his usual even-handed manner. Birth announcement — Not one to be discouraged, Ji breaks house arrest to pursue one final lead in the Mokvar mystery. The scouring of the Spire — Garrosh and Spazzle follow Ji to Blackrock Spire, where more than one familiar face turns up. Stay of execution (part 2) — Mokvar staves off Garrosh’s vengeance with an offer the Warchief can’t refuse. Professional courtesy — …and then there’s the small matter of settling transcription duties. Inside job — Mokvar begins recounting the story of his strange behavior, beginning with his visit to Neeru Fireblade. Collateral damage — Spectral assassins again ambush Mokvar, this time in Ironforge, and old friend Theldren pays the price. The enemy of my enemy — …and playing her like a fiddle. In which Ji has kind of a rough week — Having escaped from house arrest in Orgrimmar, Mokvar makes his way to Mount Hyjal…where he finds himself in the clutches of a huggy figure from the past. Out of the frying pan, into the Firelands — Mokvar tracks Ritssyn to the Firelands and gets a new lead on the Council of the Black Harvest. Pursuing the Black Harvest — Mokvar’s aforementioned pursuit of Kanrethad Ebonlocke and Jubeka Shadowbreaker leads him to Shadowmoon Valley. Pull me back in — Having tracked down the Council of the Black Harvest, Mokvar returns to his former warlock ways. How to win friends and influence demons — Seeking an opportunity to regain the Nether Prism, Mokvar accompanies Kanrethad and Jubeka to the Black Temple. Those who fight monsters (part 3) — …and the small army of demons Kanrethad has amassed. Wake-up call — Garrosh, Mokvar, and the rest of the group finally reach Valthalak’s inner sanctum to confront the drakonid lord, but the ensuing confrontation takes an ominous turn.